The Ranch section of the Henry’s Fork continues to be amazing. Large fish in pods up eating B.W.Os daily. The Hatch starts around 11:00 am and continues throughout the day. I would have sparsely tied Blue Wing patterns. I have had good luck fishing a #20 No hackle. 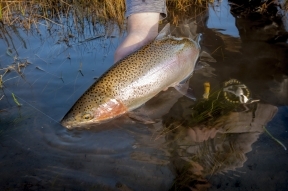 The Ranch closes for fishing on November 30th so there are still plenty of good days ahead. The BWOs will likely drop off by the end of this month but midge fishing can be incredible in November. Small bead heads are the pick of the day in the box. The Box is still around 100cfs so I would not put a boat in. I really enjoy wade fishing the Box Canyon. There are multiple areas where the Box Canyon can be accessed. If your unfamiliar with the different access points come in the shop and we can help you. The lower river continues to be outstanding! 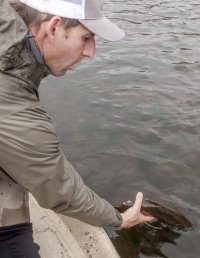 The Brown Trout traditionally start to get on spawning beds right about now. Please keep a sharp eye out for these spawning areas. When you see an area with clean gravel about the size of a dinner table, give that area a wide berth, that is a spawning bed. I don’t have much to say as far as new patterns. Blue Wing Olives and small bead heads. #16 and #18 Zebra Midges and Lighting Bugs in the same size. The No-hackle in a #18 or #20 will work well when you start to see nose’s popping up. 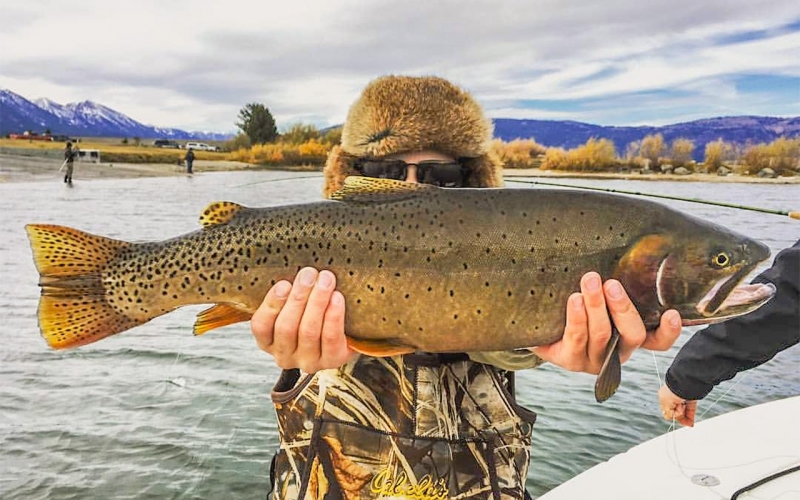 The South Fork has continued to fish well. The flies have not changed much scenes last week. Small bead heads and Blue Wing Olives. I would also have some streamers. The Brown Trout spawn is always a week or two behind the Spawn on the Henrys Fork. Look for Beds on the South Fork to start appearing right around Halloween. Again use caution when you are around these spawning fish. Get a high vantage point and watch how these spawning fish act. As always be prepared for any and all weather conditions if you going to do a float. The flow on the South Fork at Irwin is 2270 cfs so a canyon float is going to be an all-day adventure. Look for the flows to drop even more later this fall which opens up a lot more wading access. Again not much in the way of hatches on the Teton. I think the Teton is about as good as I have seen it all season. Great hatches and lots of fish eating Blue Wings. I would also fish streamers on the Teton. As I have said in the past, it’s not the pattern it’s the color that’s important. I have had my best luck with olives or black on the Teton. A #4 black Jaw Breaker or A #4 olive Little Kim’s seems to do the trick. #18 and #20 Zebra Midges in brown will also turn some heads. #18 and #20 No Hackles or Sparkle Stackers will work on the surface. The hot spot on the Madison seems to be between the lakes. However don’t write the rest of this river off. The wade section has been fishing very well. Again its small beads and streamers. There has been some great Blue Wing hatches during the day. 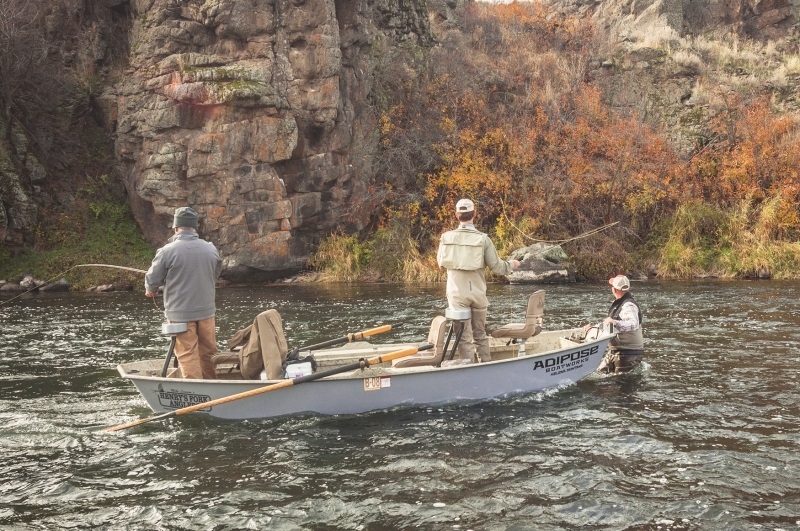 The best fishing of the year occurs in the fall. The general season runs through the first Sunday in November which is November 6th this year. Some areas of the park are different so it pays to check the regulations closely. The best options are the Madison, Firehole, Gibbon, Yellowstone, Slough Creek and Lamar Rivers. You can’t go wrong with a late season trip in the park. Henrys Lake is fishing as well as it did on the opener. I was on Henrys Lake last Sunday and was just curious to see if there was something these fish would not eat. My conclusion is no! There is nothing these fish will not eat. The state boat ramp is the place to be if you want to catch numbers. I would say that most of these fish are between 18 to 20 inches and will eat anything in their path. Leeches and #16 bead head Pheasant Tails will get it done. If you want something less crowded and more challenging try the county boat ramp. There are a few creeks that run in on the west end of the lake. That’s where you will find the big Bookie’s. #14 Scud’s and Halloween Leeches will work well.